Be the only ISO on the block merchants love talking to. After reading this guide you’ll confidently walk into your next merchant’s establishment – not as the salesperson they dread… but as the “expert” they’ve been waiting for. The person they NEED to talk with. A simple way to establish immediate rapport (Hint: You won’t even talk about credit cards). How to re-position yourself (you’re not the salesperson they dread, you’re the person they’ve been waiting for). A “word-for-word” script that gets you an immediate audience with the business owner. The “oh-by-the-way phrase” that has merchants happily handing you their statement. Fifteen minutes from now you’ll have a clear path to signing more accounts, generating multiple income streams from a single visit, adding more volume and more clicks to every account you have and… cutting attrition to the bone. 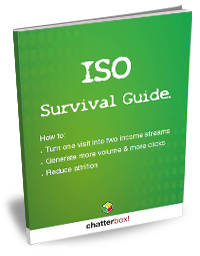 Get the guide now, it’s is free. Find out why ETA created a first ever “Portfolio Enhancement & Protection” category just for Chatterbox© at the 2014 show in Las Vegas. Get the guide now.